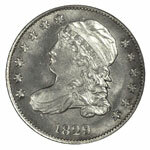 The Capped Bust dime was derived from models originally prepared for the half dollar in 1807. But unlike the half dime, coinage of which was suspended from 1805 to 1829, the minting of Capped Bust dimes followed the half dollar by just a couple of years. These dimes were produced intermittently from 1809 through 1827, using the old technology of the open collar and a separate edge reeding machine. 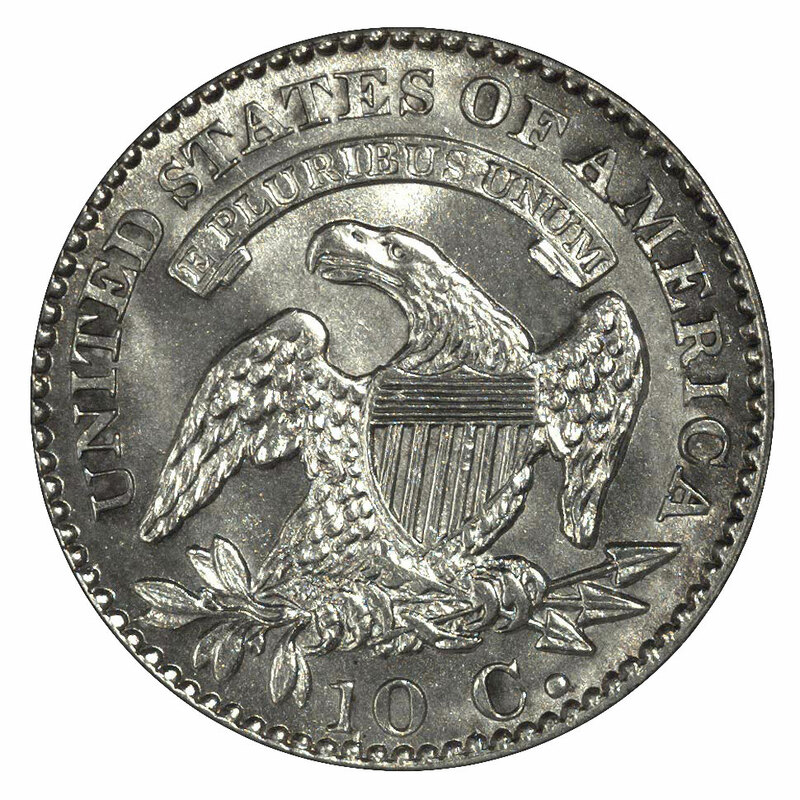 Beginning in 1828, the dime was minted within a close collar that impressed its reeding at the same time as the obverse and reverse were struck. This resulted in sharper coins that possessed raised rims and were uniform in diameter. Coined from 1828 to 1837, these dimes are commonly called the "small size" Capped Bust type, though in fact this distinction is negligible. The 1828 dimes are transitional, combining the dies of the earlier type with the close collar of subsequent issues. Capped Bust dimes tend to be a bit better struck than half dimes of the same type, and this eases the grading process for circulated coins. Even so, weakness of strike may appear above Liberty's eye and at the eagle's claws and the arrow feathers. To someone unfamiliar with these coins, such weakness can make a dime look more worn than it really is. In such instances, other clues such as the presence of mint luster at or near the affected areas can reveal that the missing detail is due to a striking deficiency. Below the grade of Extremely Fine, striking weakness has less of an impact, and what seems to be wear almost certainly is. Following the text and photographs in the book The Official American Numismatic Association Grading Standards for United States Coins makes the grading of circulated pieces quite simple. Mint state examples of most dates within this series are not especially rare. The dates which turn up most frequently in mint state are 1831 through 1835. 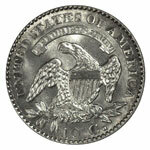 The 1835 dime in particular seems to have benefited from a small hoard of nice examples. In contrast, the scarcest dates appear to be 1828, 1829 and 1837. Since most Capped Bust dimes of the years 1828-37 were reasonably well made, it is usually what happened to them subsequently which has caused them to be reduced in grade from the gem level. Perhaps the most common abuse suffered by these coins has been unskilled cleaning. Silver is naturally reactive, and coins made from it will tone over a period of years. When it's even and not too deep, this toning can actually enhance a coin's appearance and earn it an extra grade point or two. But blotchy, thick or very dark toning does not appeal to collectors, and therein lies the problem. Over the past several generations since these coins were made, both numismatists and the general public alike have attempted to remove toning from them, whether it be attractive or ugly. Their often clumsy efforts have reduced the aesthetic value of many Capped Bust dimes and, in some instances, rendered them unacceptable to the major grading services. Also unacceptable are coins that have been retoned through some accelerated process and have an unnatural look. Some other causes for downgrading include excessive or critically placed contact marks, dull luster and an extremely poor strike (though this last point is typically a minor consideration). The ideal mint state type coin, irrespective of grade, will have moderate to very bright luster, a natural color (whether toned or "white") and minimal contact marks that are well hidden within the busier parts of the design. Fortunately, enough of these coins survive over several dates that the advanced type collector will surely find one that's suitable.